Key Difference: Mitosis is a type of cell division in which a cell nucleus divides into two identical nuclei. In terms of cell division, cleavage refers to the process of division of cytoplasm (Cytokinesis) in the animal cells. Cleavage in animal cells takes place after the telophase of mitosis. Mitosis is a type of cell division in which a cell nucleus divides into two identical nuclei. The newly formed identical nuclei are also termed as the daughter cells, as they are genetically same as the parental cell. However, in cases where DNA gets changed due to any reason, the daughter cells may not be identical to parental cell nucleus. Mitosis is a process that takes place in various steps. Following stages can be considered to understand the process of Mitosis. Prophase- In this phase, the nucleoli disappears from the nucleus. The chromatic fibers are tightly coiled and they condense into chromosomes. Metaphase – The chromosomes are lined up at an imaginary line that is equidistance between the two cell poles. 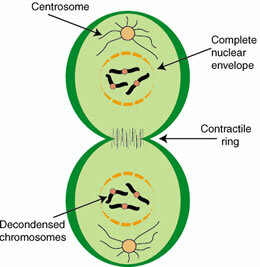 Anaphase – Paired chromosomes move apart along the microtubules upward opposite poles of the cell. By the end of this stage, the two poles of the cells have a complete set of chromosomes. Telophase – The microtubules become longer and daughter nuclei start forming at the two poles. Nucleoli appear again and nuclear envelopes are created. Cleavage refers to the process of division of cytoplasm (cytokinesis) to form two different daughter cells in the animal cells. Cleavage in the animal cells takes place after the telophase of mitosis. Mitosis and cleavage makes up the mitotic (M) phase of the cell cycle. Cleavage is achieved by a constricting belt of actin filaments interacting with myosin. The filaments slide past one another and the belt’s diameter tends to increase. It pinches the cell and creates a cleavage furrow around the circumference of the cell. The process continues until the furrow slices all the way into the centre of the cell. This is the point where actually the cell gets divided into two. During the division of cells in an animal tissue, the cycles including the separation and unification presumably allow the cells to rearrange their contacts with neighboring cells. A new extra cellular matrix is formed so that the newly formed cells can be accommodated and adjusted within the tissues. Cleavage refers to the process of division of cytoplasm (Cytokinesis) in the animal cells. Cleavage in the animal cells takes place after the telophase of mitosis. Mitosis is a type of cell division in which a cell nucleus divides into two identical nuclei. In embryology, it also refers to the first process of development that follows fertilization. In this process, a large single cell zygote is divided into smaller cells known as blastomeres. In embryology, mitosis is the process by which cells divide. The dividing cell is what causes an embryo to become a fetus and have the features of an average human being.